It would be a mistake to think that trade began in North America with the arrival of Europeans. On the contrary, a vast network of trade routes already existed. The territories occupied by the various First Nations did not all offer the same resources. Certain items, such as the precious wampum beads, only came from a specific region, but they were traded everywhere. Since they did not have a money-based system, the First Nations traded among themselves on an item-for-item basis. This form of direct trade is also called barter. It may seem simple and straightforward, but in reality the trading process was very complex. A trading expedition might last several days, or even months. Only the men left to trade, because the women, children and elderly would not have been able to cover the distances involved. The fact that these expeditions travelled so far shows just how essential trade with other nations was. Do you wonder how the various nations could communicate if they did not speak the same language? In fact, interpreters already existed. The language most often used for trade in north-east North America was Wendat. 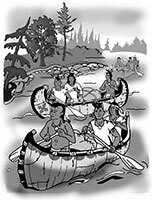 Since the Wendat were the main intermediaries between nations, it was normal that their language was spoken at trade gatherings.